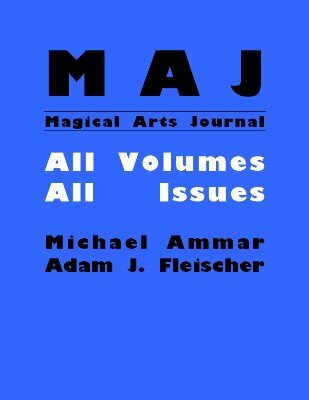 The Magical Arts Journal was a monthly magazine published by Michael Ammar and Adam Fleischer in the 80's. Each issue, now a collectable, contains a wealth of information on effects, business, theory and stories on magic. It is a ground breaking magical publication devoted to both the art and business of magic that was published and edited by FISM world champion magician Michael Ammar and magic publishing and event production innovator Adam J. Fleischer. You’ll find timeless business insights, original performance material and priceless tips and advice about the work and money in magic from close up and stand up magic professionals who were making their living on cruise ships, in comedy clubs, at trade shows and private parties. The artists who contributed to The Magical Arts Journal are a Who’s Who List of influential magic thinkers and the most successful full-time pros of the 1980’s, including: Dai Vernon, Larry Jennings, Tommy Wonder, Paul Harris, John Kennedy, Jay Sankey, John Cornelius, David Roth, Martin Gardner, Jamy Ian Swiss, Chris Kenner, Roberto Giobbi, Doc Eason, Eric Mead, Richard Sanders, Gary Kurtz and many more.